Published in Edmonton Journal (March 15, 2019). Energy markets are changing and so is our climate. These are not just facts, they are the lived experience of Albertans dealing with a downturn that feels different this time — and the fires, smoke and floods that have come to define our summers. Nothing matters more right now than determining how to find a way for Albertans to thrive through this reality. However, the hard and honest conversations we need to have about our energy sector are being hijacked. Our future matters too much to let that happen. 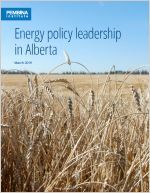 Last week, Pembina Institute released our Energy Policy Leadership report, which includes 23 reasonable recommendations for consideration by the parties vying to lead Alberta. We know that Alberta’s economy is built on our natural wealth — including oil and gas as well as sun, wind and water. With this in mind, the recommendations include embracing technological innovation, renewable energy and energy efficiency. They also include policy improvements for oilsands, so the sector can compete in the low-carbon future. The work we have always done at Pembina addresses a very practical problem: how does Alberta’s energy sector continue to thrive in an increasingly carbon-constrained world? The rhetoric is more alarming and divisive than ever. Some would have you believe that you are either “for” the oil and gas sector or “for” acting on climate change and responsible development, that you cannot be both; there is no middle ground. We disagree, and we believe most Albertans do too. The truth is: if we care about Alberta’s energy industry and the people who work in it, everyone needs to start working together. Polarization, spurious accusations, and name-calling will not make new energy projects move faster. In fact, those tactics are likely to have the opposite impact — dividing Albertans and Canadians further and undermining the progress that has been made by industry, governments and civil society working together. At Pembina, we are proud of our 35-year track record partnering with leading energy companies that recognize we share the same objectives because a lower-carbon oil industry is a more competitive one, and responsible oilsands development is only possible if all stakeholders work together on solutions. We have drawn attention to the need for industry and governments to address the cumulative impacts of their operations. This led to improvements in areas like water use, greenhouse gas intensity and monitoring. We stood with oilsands leaders in recommending and supporting smart climate policies that reduce emissions while rewarding innovators and driving improvements. We participated in multi-stakeholder processes to support land-use planning and conservation for over two decades culminating in Alberta establishing the world’s largest protected boreal forest adjacent to the oilsands. It may be convenient to look for scapegoats in these tough economic times. However, this rhetoric is distracting from the systemic changes and emerging challenges in Alberta’s oil sector. Many would have you believe market access is the only issue. But it is more complex. Businesses like McKinsey, Bloomberg, and even many oil companies foresee scenarios where global oil demand peaks in less than a decade. Electric-vehicle deployment projections are reassessed and increased annually. Unsubsidized solar and wind energy now outcompete fossil fuels for electricity generation. International investors are requiring evidence that oil companies have plans to reduce their carbon footprint. Renowned energy economist Peter Tertzakian notes that “new investment into oil and gas companies is dry pretty much everywhere, not just Canada” and that the route to success involves a better, lower-carbon product. Alberta’s political leaders have a choice. They can double down on a system that looks backwards or they can embrace the vision of making Alberta’s oil and gas industry a world leader. There is no going back in this rapidly changing world. However, that does not mean Alberta must be left behind. This means implementing policies to support real diversification and reduced carbon intensity. Pembina remains committed to working with everyone who shares these goals. Let’s stop wasting energy and get to work on our shared objectives of keeping Alberta healthy, prosperous and sustainable in the long-term. Simon Dyer is the executive director at the Pembina Institute. He is based in Edmonton. Simon Dyer is the executive director of the Pembina Institute. He is based in Edmonton.